Create A Stronger Filter With "Find Related Terms"
It is a sport for patent filers to use the most uncommon words, in attempt to hide the IP as much as possible. It makes it difficult to find the right vocabulary for your filter. One way to go about it is shown in "Quickly finding the correct classification codes (CPC) of a certain technology". The solution of Find Related Terms is found in the problem. By taking the large context of the term and using that context to find other words having a similar context, we can identify related terms. It took days of precomputing to generate all the related terms. There are many potential uses for Find Related Terms, including finding vocabulary to hide your patent or even finding new terms to market your invention. However, the main usage is to enlarge your search vocabulary. Take the case of the baby bottle (“baby bottle” in Title and abstract), it will give you 1734 patents. 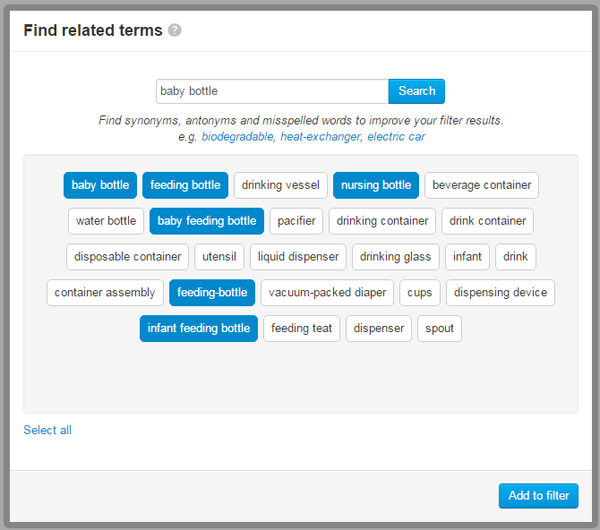 By searching "baby bottle" in Find Related Terms you can select "nursing bottle", "baby feeding bottle", "feeding-bottle", "infant feeding bottle" and "baby bottles". The enhanced filter will result in 4662 relevant patents.